Movie fans usually install Seen On Screen on their systems because they believe that it is a very powerful and beneficial piece of software. If you go to seen-on-screen.thewhizmarketing.com and read the information provided there, we are sure that you will also think that Seen On Screen is a useful extension. We cannot blame users that they are so gullible because the description of this software is very appealing. First of all, it is said that it can grant access to latest show reviews, interviews, movie trailers, and streaming websites. Secondly, this application promises to keep users up to date with the latest movie news. Even though it claims to be so useful, it is still known to be a potentially unwanted program (PUP), so you should use it very carefully. In case you have not installed Seen On Screen yourself or it acts the way you do not like, you can remove it really quickly. We will tell you how you can erase this software in this article. There is no doubt that you will notice new extensions added after the installation of Seen On Screen if you open the Add-ons Manager of Mozilla Firefox and Google Chrome browsers. The extension for Google Chrome has a particular ID bbhleiekcbdhhmhpodmcnmipiodipifd, which is visible after enabling the Developer mode. In case of the extension for Mozilla Firefox, it will include the name of the actual program, e.g. Seen On Screen 19.13, so we are sure that you will recognize and be able to remove it yourself. Most probably, this extension will be visible for users who live in India, Pakistan, Egypt, Algeria, U.S, Thailand, Brazil, and Spain because it is known that Seen On Screen is the most prevalent in these countries. It is advisable to remove this product of APN, LLC even though your place of residence is different but you have still encountered it. Seen On Screen is often called a potentially unwanted program because it sneaks onto the computer and then immediately applies changes. It has been observed that this program will change the search engine and modify the New Tab page settings, which means that you will see the modified version of mysearch.com every time you open your Mozilla Firefox or Google Chrome. Even though the search engine itself looks quite decent (users find easy-access links leading to social-networking websites and other movie-related web pages on its main page), it might provide you with the modified search results. Therefore, it would be best that you do not use the search engine. We do not recommend doing that because we know that these modified search results might really quickly take users to bad web pages. In other words, they can expose to threats. If you have visited the official website of Seen On Screen, you have probably noticed that only the version of Google Chrome can be downloaded from there, which means that the extension for Mozilla Firefox travels bundled mainly. 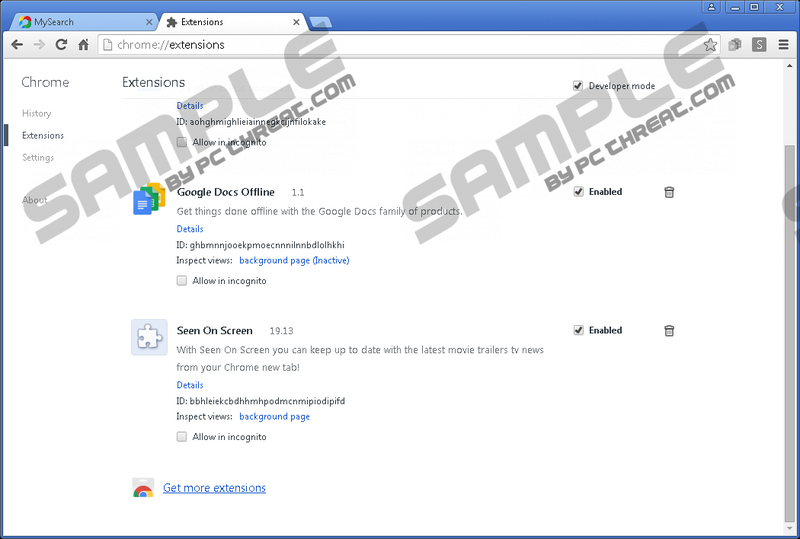 In fact, the extension for Google Chrome might be distributed bundled with other applications too. In addition, some users say that they see pop-ups offering to install Seen On Screen. If you see these ads too, it is very likely that you have an advertising-supported application installed on your computer as well. Do not forget to remove it after you eliminate the extension of Seen On Screen from your system. Seen On Screen only adds extensions to Mozilla Firefox and Google Chrome browsers, which means that it will be enough to delete them one by one in order not to see this software on the system anymore. You can use instructions provided below in order to erase this program or you can simply scan your computer with an automatic malware remover, such as SpyHunter. If you are going to delete this software manually, take care of other undesirable programs which might be hiding on your computer too. Open your browser and tap Ctrl+Shift+A simultaneously. Find and click on the extension you wish to remove. Click on the extension and click the recycle bin button placed next to it. Quick & tested solution for Seen On Screen removal.